Life's busyness and the stress it drags along with it is common. I've read countless articles, Facebook statuses, blog posts, and books about letting go of the busy, "keeping things simple" and enjoying life. None of these well-meant prose touches the extreme hard work (and sadness) it takes to actually let something go that is loved in one's life. Photography has impacted every area of who I am. When I started taking pictures and capturing beauty when my now 9 year old daughter was a newborn, I discovered something special through the lens. My thankfulness to the Creator grew because I saw life in little moments. Each capture is a gift. I challenged myself and experimented. It was easy because it was something I loved. Eventually people asked me to take pictures for them and my first paid gig earned me $20. When I look back on my first few years as a "pro", I wish I had done things differently. I wish I learned more about lighting, equipment, and the business before I accepted money. I often got by on my creativity alone. While I could compose a picture and coax a smile, I missed things too. Photography is such a complex art. The more I learned, the more I realized I didn't know. I figured it out as I went and I appreciate my clients in the early years who accepted and loved me where I was (and kept coming back for more!). And that brings me to the business I have today that is thriving. Families, weddings, babies, cantankerous toddlers... looking through my camera's lens still makes me smile. My calendar usually starts filling in March and I stay busy until the rains come in earnest in November. Even when I say I am only taking one session a week, I often take two, or three, or four because I can't say "no" to the opportunity to serve. God has created such unique and lovely people. What an absolute privilege I have to spend time with families and do my best to show a glimpse of their beauty! While I figured out the science side of photography, I'm still not so good at the business side of things. I'm not good at taking money, scheduling, rescheduling, dealing with complaints, and cancelations stress me out. I'm not good at time management. I spend hours editing each session and time eats away when the many things in my "regular" life are calling to me. How many times in the last 9 years have I said to my family, "I need to work on these pictures right now. Leave me alone for just a few more minutes." Many. Daily. Too often. And tears well up in my eyes as I write this because I LOVE photography. I LOVE taking pictures for families. I LOVE providing a service that blesses people and blesses me. And yet, the last few years have shown me, not too subtly, that something has to give. I've prayed and pondered and talked endlessly with my husband and eventually we both came to the same conclusion.... the busyness has to go and essentially that means the photography business has to go. As fantastic as my clients are, and as much as I love spending time with them, it isn't just snapping the shutter a few times, it is the hours more behind the scenes. Precious hours that are not forgiving or replaceable. 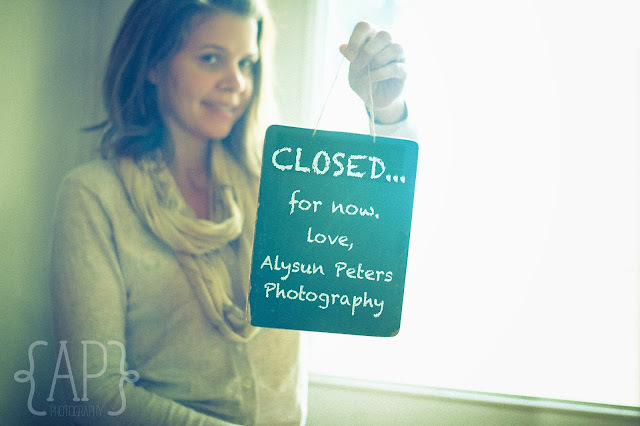 So it is with a heavy heart that I say good-bye to my friendly and beautiful clients for now. I bonded with you in a way you may not even realize. I prayed for you as I edited your sessions. You asked me to take your pictures, but I saw so much more. The love in a family, the bond as a couple started their lives together. I've always prayed that I would see a glimpse of the Father's love for us, and through photography, I got just that. I will miss you and hope you share photos with me as your families grow.